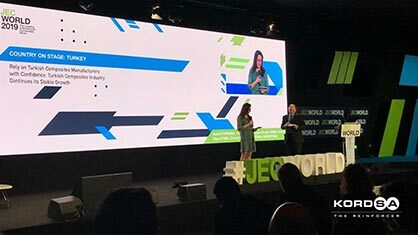 Kordsa attended JEC World 2019, the largest international gathering of the composites industry, held in Paris between 12 and 14 March 2019. Among all the products and technologies showcased by Kordsa during the Expo, the light weighting technology in heavy duty vehicle chassis system, developed in co-operation with Ford Otosan, caught the most attention. Kordsa and Ford Otosan also presented this new light weighting technology at “Composites Exchange” conference on March 13th within the “Automotive & Transportation” track. 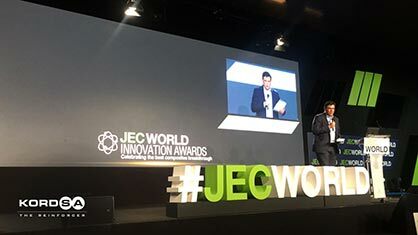 At the JEC Innovation Awards, which awarded sector-leading innovations, Kordsa took part as a jury member to evaluate 30 innovative composites projects in 10 different categories. In his speech at the ceremony, Kordsa’s COO of Composites, Murat Arcan explained how Kordsa was inspired from the unique moments in life and translated these moments into cutting edge technologies. Emphasizing he was honored to be among the jury on behalf of Kordsa, Arcan continued: "As Kordsa, we put innovation at the heart of every step we take. In parallel to our vision to reinforce life, we are the explorers who work with passion and always seek for better. Kordsa’s COO also underlined the outputs and ongoing projects at Composite Technologies Center of Excellence, and said: “At this innovation hub, we have recently developed a new fast cure press curable prepreg system, namely CM14 resin, which eliminates waterspot and whitespot problems thus providing high visual clarity. The new light weighting technology in heavy duty vehicle chassis system, developed in co-operation with Ford Otosan, is a game changer in the industry developed in the Center. Our innovative leaf spring for heavy duty vehicles over 16 tons also includes structural health monitoring systems used for process optimization, part qualification and online health monitoring purposes. As part of JEC World 2019, on 14th of March at Turkey’s ‘Country on Stage’ event, Kordsa participated in the panel discussion on the Turkish Composites Ecosystem. 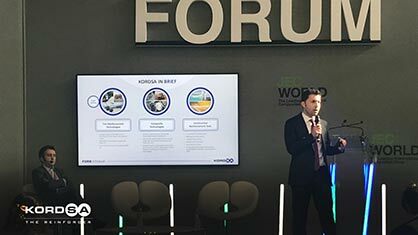 At the panel, Kordsa underlined Kordsa’s competencies in composites industries, focusing mainly on the company’s operations in the US and the ongoing projects at the Composite Technologies Center of Excellence.